Hankook Optimo ME02 K424 is an all-season tyre which has been developed for the harsh and heated climatic conditions seen in India. It has been equipped with heat-resisting properties which fares well in dry conditions. The tyre gets enhanced durability and high tread life to ensure more number of kilometres. It is endowed with a solid structure and has been given an advanced tread pattern which provides greater traction. The cutting-edge technology used in the tyre aids in better cornering and apt steering response. The high on life tyre gets low rolling resistance, which helps in returning better fuel efficiency. Hankook has furnished Optimo ME02 K424 with the highest performance ratings in terms of dry, noise, comfort and wear. 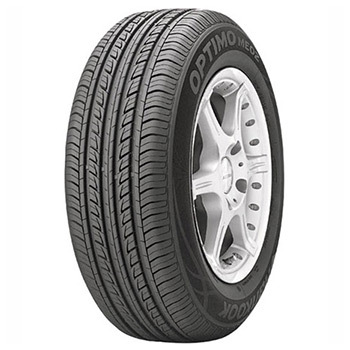 The Optimo ME02 K424 is covered under industry best standard warranty offered by Hankook. The Optimo ME02 K424 gets a shoulder block in the rib form infused so as to avoid irregular wear and tear of the tyre. The ride quality and handling of the tyre has been enhanced by the use of a middle block multi-kerf. It has an innovative optimum 4-groove pattern, which provides better wet performance and resistance against aquaplaning. The 5-Pitch and high pitch ratio (1.6) has been retained for noise distribution, while the dual jointless full cover advances the durability and braking performance. The application of high-density belt cord and high hardness thin bead filler boosts the steering stability of Optimo ME02 K424. The aesthetic design and low rolling resistance of the tyre tread help in deriving better fuel efficiency every time. Compared to its rivals the Optimo ME02 K424 claims lower levels of noise and can be used under the city as well as highway conditions.